Billow V2.5 RTA By Ehpro & Eciggity Review - Daily Vaping Deals & The Best Vape Product Reviews at Vaping Cheap! RTAs also known as Rebuildable Tank Atomizer have become extremely popular, especially as more and more vapers are learning how to build and install their own coils. In addition, there are so much more accessories available now, than ever before to help people build coils; hence is why these styles of atomizers have gained even more popularity. Firstly, I would like to thank Eciggity for sending the Billow V2.5 RTA out my way for review. The Billow RTA series is one of the most popular RTA lines on the market, and for good reason! The Billow V2.5 is the latest of the releases, and follows the footsteps of the previous Billow V2. 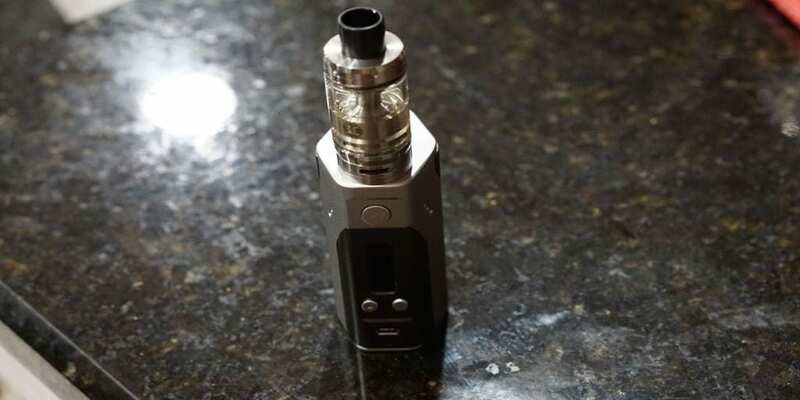 In this article, I will be reviewing this RTA and tell you what I liked and did not like about it alongside telling you whether or not I recommend this atomizer! Upon first receiving this atomizer, what I noticed first was the simple packaging. I do like the packaging overall, and it was nice to see a packaging without any fancy writings or gimmicky labeling. The labeling and information on the packaging is straight forward, giving you warnings, the name of the product alongside more warnings on the back of the box. There is also a security code on the back. Now, upon opening the packaging, immediately I noticed how large the Billow V2.5 was. It is definitely on the larger side, which may be a drawback to some, but to me I did like the size overall as most RTAs are aiming to be bigger rather than smaller. 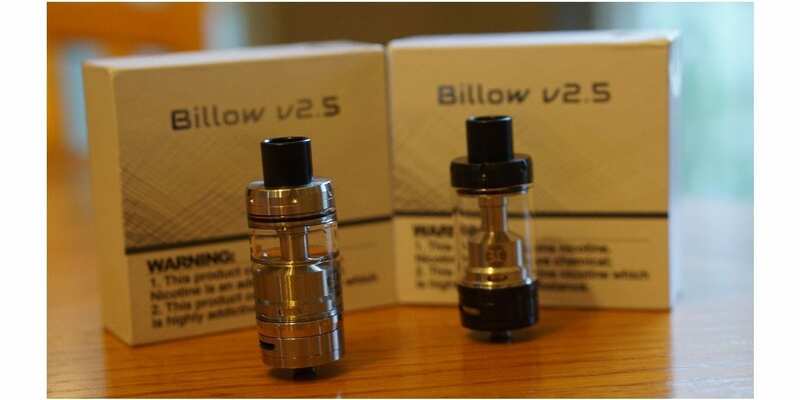 The Billow V2.5 itself is sealed in a plastic wrapping, protecting the RTA even more. You do receive a replacement Pyrex glass section, which is a huge pro for me. You do get additional extras that you would find with most atomizers such as O-rings, screws, an Allen key and an additional drip tip. The additional drip tip is a bit smaller in comparison to the drip tip that is already installed in the tank, which is definitely a nice addition as some people may not like a wide bore drip tip. This extra drip tip has a 510 drip tip adapter pre-installed, so you can use your own preferred 510 drip tip, which is a huge pro. Even though I typically use wide bore drip tips, I know many people prefer to use their own 510 drip tips. Also, you do receive some Japanese organic cotton and some pre-wrapped coils, which is great especially for people who are relatively new to building. This gives the user an easy way to get started with this RTA quickly. Like said previously, the Billow V2.5 is definitely on the larger side. It has an overall diameter on the base and top cap of 24mm, but in the middle it bulges out to 25mm. This tank is also quite tall as well, but you can definitely tell it can hold a large amount of e-liquid, 6ml to be exact. The e-liquid capacity is definitely a huge pro for me, as you probably wouldn’t need to fill this tank quite often. Even if you had to, this tank does feature top fill, so it would not really be a huge issue. I will get more into this specifically down below in the performance section of this review. This tank does have adjustable bottom airflow, and the airflow is really easy to adjust. In addition, the juice flow control was also easy to adjust as well, which are two huge pros. What is even better with the juice flow control and airflow control is that they both stop when fully opened or closed. Upon first inspecting the build deck, the first thing I did notice is that it is quite small, especially with its size. I would of expected a larger build deck, but I can understand why as this RTA is designed with the original Billow V2 in mind. The Billow V2.5 does feature a velocity styled build deck, which was a huge improvement over the original Billow V2. The size of the build deck itself is 14.5mm in diameter. All of the threads were really clean and great overall. I did not notice any rough threading, and everything was silky smooth, which is another huge pro! Lastly, the Billow V2.5 RTA By Ehpro and Eciggity came extremely clean with no signs of machine oil! This, as usual was a huge pro for me. One cleaning with water was all that was needed for this tank to be ready. Overall, my first impressions of the Billow V2.5 RTA By Ehpro and Eciggity were all positive. Like said previously, the Billow V2.5 RTA features a two post velocity styled build deck. With this build deck, it is extremely easy to build and install coils on this RTA. However, since it is not a huge build deck, I already knew fitting larger builds would prove to be an issue. Honestly, I do not think this RTA was meant for large builds such as Fused Claptons, Aliens or anything like that. This may be a con for some, but for me it was not and I will go into why later on in the article. Fitting normal round wire builds in the Billow V2.5 was easy, and proved to be no issue for me. However, do not expect to put large diameter builds in here such as 3.5mm ID, as it could possibly cause a short, which is something you do want to avoid. The Clapton build I was able to fit was 2mm in diameter. This was not a Fused Clapton coil, just a normal Clapton build. It was extremely easy to install these coils as well due to the velocity styled build deck. With larger diameter Clapton coils, I had a hard time trying to get it to fit, and these types of builds just do not fit really well. You probably can get a 2.5mm diameter Clapton coil to fit, but honestly it was not necessary for this RTA. With Clapton coils it is easier to cause a short, because there is a threaded barrel section that screws onto the build deck then into the tank itself, just like the Billow V2. Wicking the Billow V2.5 was straight forward, and wicks pretty similar to other RTAs. There is a channel for you to put cotton in, but I do not recommend stuffing the cotton into these channels. All you really need is for cotton to sit right on top, and just barely leading into the cotton channel. I found this to be the most effective and efficient way of wicking this atomizer. Overall, building and wicking the Billow V2.5 was extremely easy. Like said previously, the velocity styled build deck is a huge improvement over the original Billow V2! Now the biggest question of this review is probably how does the Billow V2.5 perform? Well, it has certainly impressed me in regards to performance! Firstly, my favorite build for the Billow V2.5 was a simple 24GA Kanthal dual coil build which had a resistance of about 0.3 ohm. With this build, I found it to be extremely satisfying in regards to vapor and flavor production. My preferred wattage for this specific build was between 45w and 60w. Honestly, with this build you did not need a ton of wattage to get a satisfying vape experience, which was certainly a huge pro! Like said before, you can fit smaller Clapton builds in this RTA, but it really isn’t needed to get great performance out this tank; hence is why I preferred a simple build rather than a complex build. This is the reason as to why this build deck was not a con for me. Since the overall performance was excellent with round wire builds, there was no need for a Clapton build. Of course, this is subjective, and many people want or prefer bigger builds in their atomizers. The flavor on this RTA is absolutely incredible. This is some of the best flavor I have had out of an RTA in a long time. Honestly, I was extremely impressed with the flavor of this RTA, as I did not expect the flavor to be this good, especially with a simple round wire build and considering the size of the Billow V2.5. If you are looking to flavor chase, this is definitely an RTA to consider. Even with its larger design, the flavor is not affected at all in my experience. You would honestly think with an RTA of this size the flavor would be okay, but I think due to its design, the flavor is just incredible. The vapor production was also great with the Billow V2.5. This is not a cloud chasing RTA by any means, but the vapor product was certainly there and was satisfying for me. I typically had the airflow wide open and it does give a relatively restrictive lung hit. I personally enjoyed the airflow this atomizer has to offer, but I know some vapers who want a ton of airflow might not like this. However, if you prefer a restricted lung hit, then this is an RTA you would probably enjoy. Like said before, adjusting the airflow is really easy and it stops when it is fully closed or fully opened. The same can be said about the juice flow control. With the 6ml e-liquid capacity, I found that I did not have to fill this tank often, especially with this simple 24GA Kanthal dual coil build. 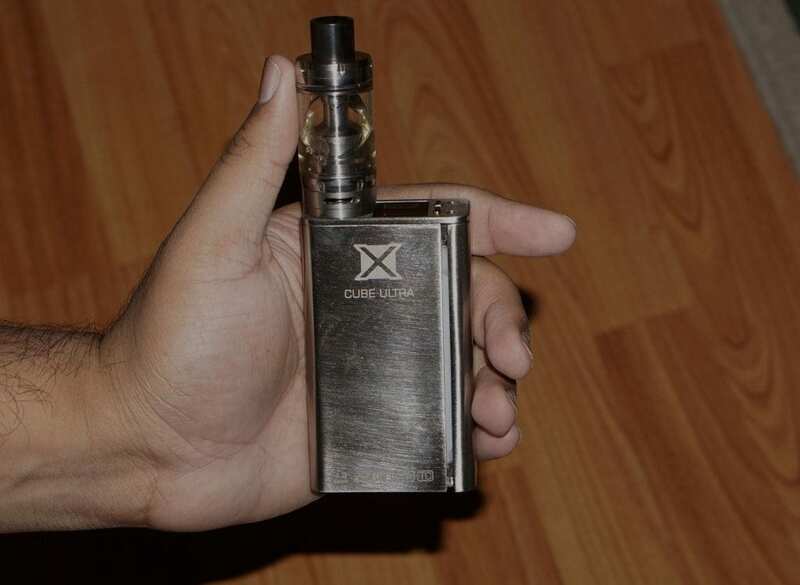 I did notice that this tank does utilize e-liquid efficiently and doesn’t really plow through e-liquid like a lot of other RTAs. This of course could be due to the build I had installed, but even with smaller Clapton coils, it did not guzzle e-liquid. I found this to be a huge pro, and was happy that I did not have to fill it often. Of course with such a large capacity you would not expect that, but in my experience, some RTAs really go through large amounts of e-liquid quite quickly. Speaking about e-liquid, I recently published an article going over some of the best cheap e-juice right here! You can also check out this article by clicking the link down below! Click Here to Check Out the Best Cheap E-Juice Article! Even when filling it though, it is extremely easy as the top fill is threaded, and comes off with ease. In addition, the fill holes are massive, and you can literally pour e-liquid down into the tank. Overall, the performance of the Billow V2.5 was impressive. I was honestly surprised by how well this tank performed with such a simple build, which is great for beginners! Even though the performance was excellent, there are some cons which I will mention next! Most, if not all of these cons listed are subjective. I honestly did not find any cons for this tank while using it, but still there are some to be mentioned. The first con would probably be the size of the Billow V2.5. Like said previously, this is a pretty big tank. Many people want or prefer a much more compact tank, but for me this was not a con especially considering the e-liquid capacity. There are some tanks available that are quite large and do not fit this amount of e-liquid. Although this is the case, some people will still not like the overall size of this tank. Another subjective con is the airflow. This tank does not have tons of airflow. This is something definitely to be mentioned as many people want an airy draw, or probably more airflow this tank has to offer. The airflow is certainly on the restricted side, so if this something you prefer, then this will not be a con for you. However, I know some vapers want a much more airy draw; therefore this has to be stated as a subjective con. 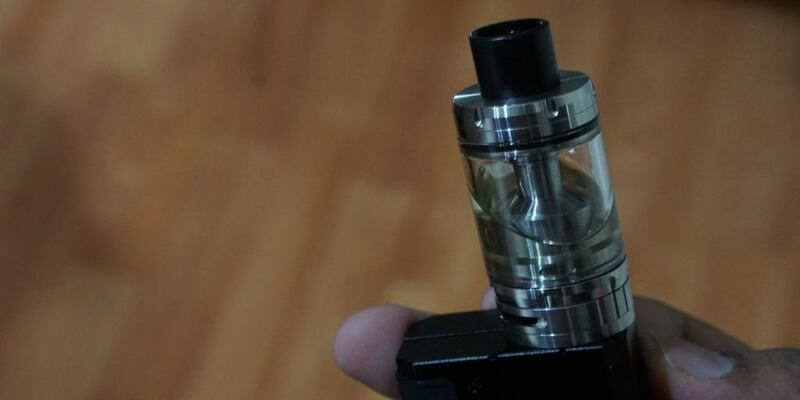 Another minor con was that this tank does not come with a single coil adapter. I know some vapers like a single coil option; hence is why this is being stated as a con. Personally, this does not bother me very much for me to consider it a con, but it still has to be mentioned since it is not included. Lastly, the biggest con for most people will probably be the build deck size. It is a 14.5mm build deck, and for the size of this tank it is quite small. You certainly cannot fit larger builds in here, and this will more than likely be a deal breaker for some people. Many RTAs that are being released feature huge build decks where you can fit massive coils. However, this is definitely not the case for this RTA. Even though there are some slight cons, and mostly subjective cons, the overall performance of this RTA is great, which leads me into the next section, my conclusion! All in all, the Billow V2.5 RTA By EHPRO and Eciggity has thoroughly impressed me. The overall performance has exceeded my expectations, and has become one of my new favorite RTAs. I honestly was not expecting the performance of this RTA, and the flavor was just incredible. The flavor coming from this RTA is truly impressive given its size. Even though some people may not like the size of the Billow V2.5, I really did not mind it. The Billow V2.5 is definitely an improvement over the previous Billow V2 RTA. The velocity styled build deck makes it much easier to build on, and the other changes such as juice flow control is a great addition. Even though there are some minor and mostly subjective cons to this tank, it does not take away the solid performance it has to offer. If you are looking for a cloud chasing RTA, then this is probably not for you. However, if you want an RTA for flavor chasing with a huge e-liquid capacity, then this is definitely an RTA to consider! Overall, the Billow V2.5 RTA by Ehpro and Eciggity is a great RTA and I have no problem recommending this RTA! If you have any questions or comments, feel free to leave them down below! Thanks for reading! Thanks for the review. I’ve been using and loving my Billow V2 for well over a year now. It’s the front runner in my current collection of RTA’s that I’ve been using for the last year and a half. When I first heard the rumors of the Billow getting an overhaul I was giddy with excitement. When the first pictures of the Billow V3 showed up, I was severely disappointed in the new look. The V3 looked just like every other velocity deck RTA on the market. Gone were the clean lines of the V2, and instead EHPro and ECiggity plopped out a bland metal cylinder that mimicked the Crius, the Griffin and others. When I stumbled upon the pictures of the Billow V2.5, at first I thought ECiggity was making a bad joke! It was everything that I had hoped the V3 was going to be, yet it showed as “Out of Stock”, hence my thinking that someone was having a lark at the V2 lovers expense. Then I started seeing reviews and hastily ordered my own! I’m current;y chomping at the bit while waiting to get my hands on this fine RTA. I ordered mine from an alternate source than what you’ve got listed, and due to the holiday last week in China it’s taking a bit longer to get to my eager hands. Reading your review was an exercise in frustration, for the simple fact that I’m still waiting! The review was clear and concise, and covered well all of the points I’d been wondering about, yet hadn’t seen in some of the other reviews I’d read. Thank you for taking the time to give a clear and detailed rundown of this RTA. I look forward to reading more reviews. Thanks for your comment! Glad you liked the review and I’m happy it helped you!